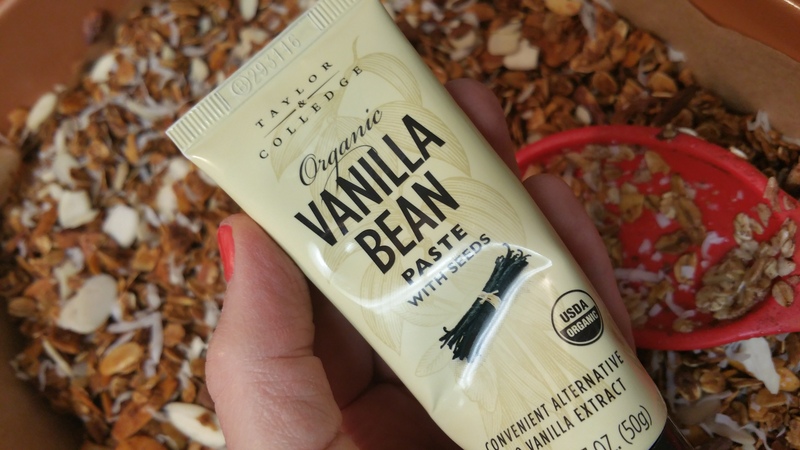 1/2 tsp vanilla bean paste or 1 teaspoon good quality vanilla extract like Watkins. Bake a total of 1 hour at 300 degrees, setting your timer for 15 minutes and stirring every 15 minutes. After the last 15 minutes take the lasagna sized pan out of the oven and set on a trivet. 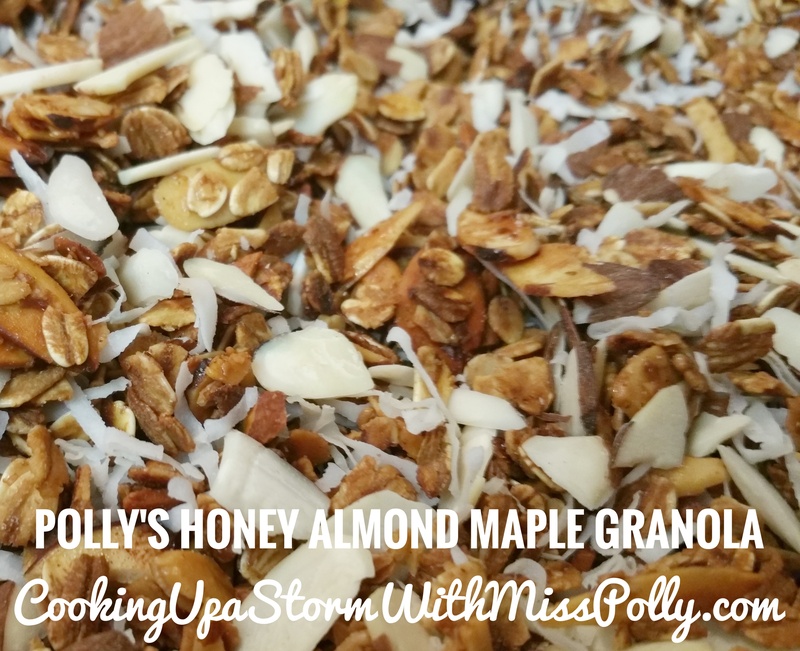 Recipe & photos by Paulette Motzko. 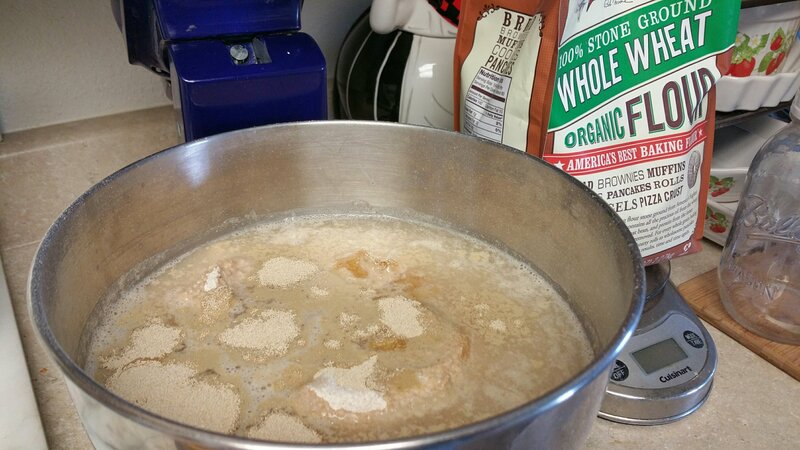 About 2 cups of plain dry Progresso bread crumbs to dredge the veggie burgers in before frying in grapeseed oil. Recipe and all images by Paulette Motzko. Mash the drained and washed beans in a large bowl with an old fashioned potato masher. This way you can control how fine the beans are mashed. I like the texture in my veggie burgers so I like some of the beans left whole. Add in the olives, green chiles and Rotel tomato onion chili mixture jelly with a large heavy spoon. Add in the two eggs and continue mixing. Add and the almond flour, and bread crumbs and continue mixing along with the mushrooms and carrots then cheddar cheese then seasonings. 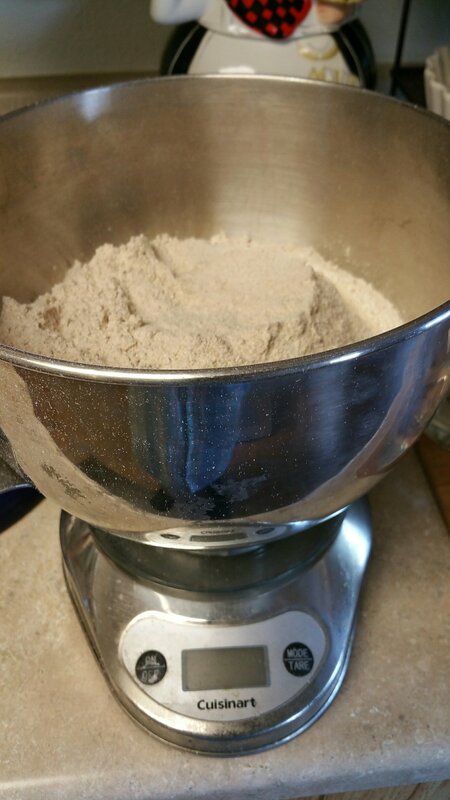 Mix well, until the mixture feels right and you can form into patties. This will make 14 patties. In a large nonstick skillet put some of the grapeseed oil in the pan and heat to medium-high heat. Turn on your vent over your range, to make sure that there’s no smoking whatsoever. Form into 14 or 15 patties, you can use a stainless steel ice cream scoop for this if you like. 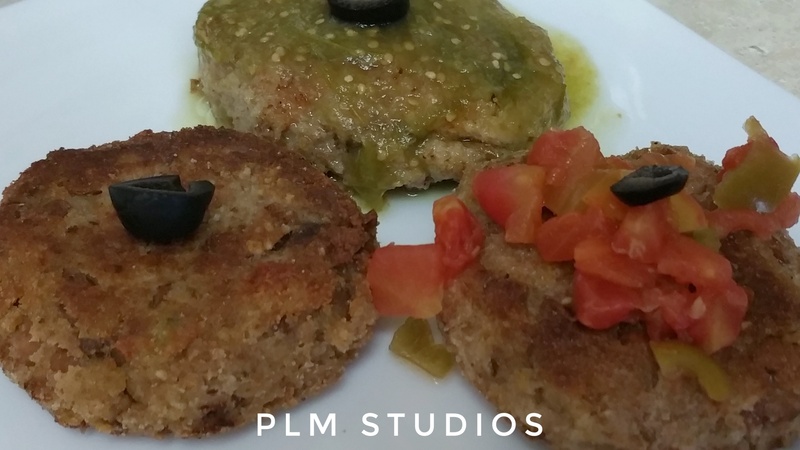 Take the formed patties and then just dredge each veggie burger patty into some of the bread crumbs and then pan fry on each side until both sides to guarantee that the patties are nicely browned. So much faster do you use the wire Whisk on my KitchenAid mixer than to cut the butter in with a standard pastry blender, and the butter is distributed more evenly throughout the scone as well. 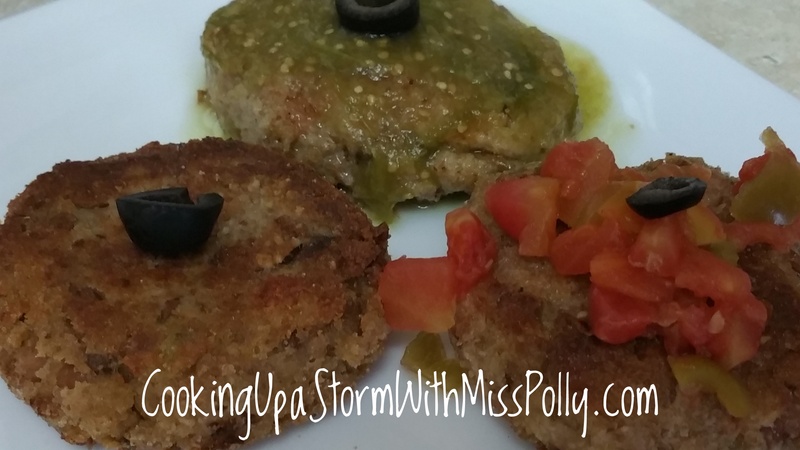 Recipe and photos by Paulette (Polly) Motzko. Dredge the chicken breast in a mixture of one fourth cup Panko bread crumbs and a couple tablespoons of Reggiano Parmesan cheese with Organic Italian seasoning added to your liking. Then lay on top of it the baby spinach, the shredded mozzarella and a little bit of the pesto and wrap the chicken breast up jelly-roll Style with two toothpicks holding it together. Fry the chicken roll in a nonstick skillet with a little bit of extra virgin olive oil in it. Cook on one side on medium-high, until it’s browned. Turn over and do the same on the other side. Bake the browned chicken roll in a 375-degree convection or regular oven for about 15 to 20 minutes. The easy how to coming soon! Nonfat milk, unsweetened West Soy Soymilk-whichever you prefer about 1 tablespoon milk product to one egg. If you didn’t want to use eggs out of an eggshell the way nature made him you could use egg substitute as and just substitute 3/4 cup of egg substitute for the three eggs. 2% evaporated milk can be substituted also to make a richer quiche. Shown here with Fruit Ambrosia and Chicken & Apple Sausages. Recipe will be coming soon! Stay tuned! 75 grams orange flower honey. This is the first time I’ve made bread this way in my life with just using the metric system in my scale and no measuring cups or measuring spoons. 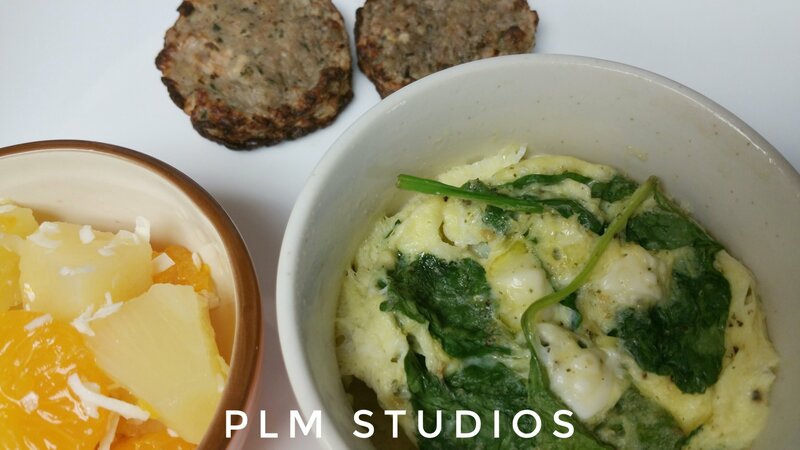 Clearing out my Cuisinart digital scale with every ingredient that I added, like what Michael Ruhlman suggests in his phemomenal book “Ratio”, is really extraordinary. I didn’t really know my scale could do stuff like that. I didn’t know you could bake bread this way and in his book he really explains the science of cooking not just cooking but the technique as well as the basic Master ratios to most every recipes awesome! 1. 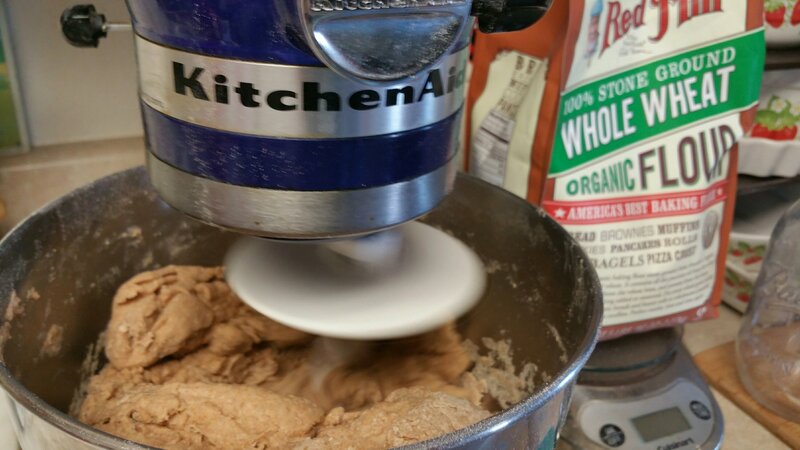 Knead- 5 minutes with a hook on a KitchenAid mixer or other heavy duty mixer at low speed. 2. 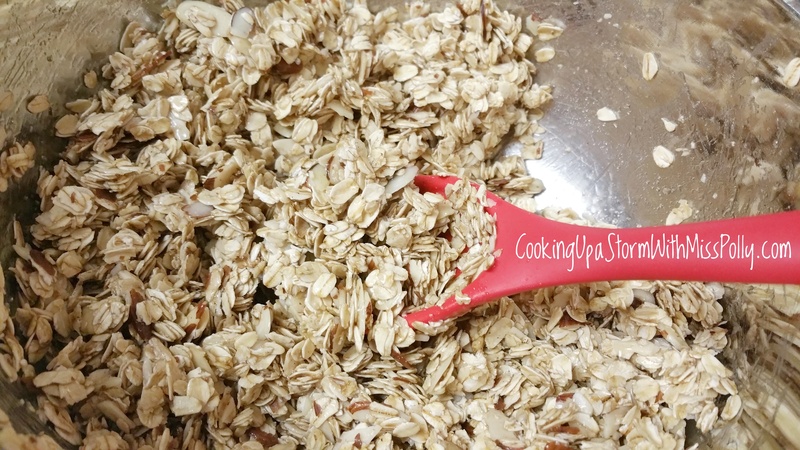 Stop periodically, to mix up any other dry ingredients that are not being mixed thoroughly by the mixer. 3. 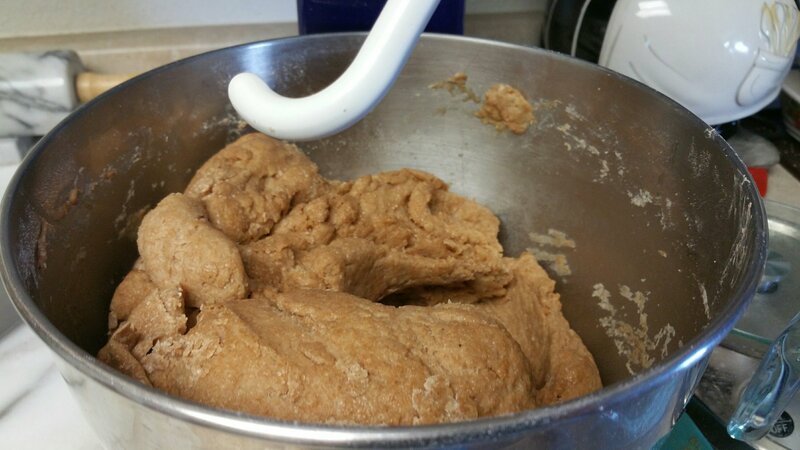 KNEAD 5 minutes more and add an additional 31 grams of honey for more moisture and sweetness in the bread dough. 4. 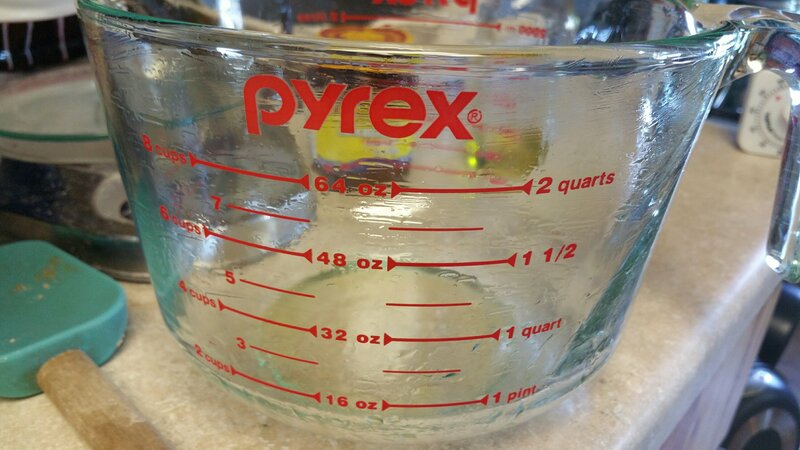 Grease an 8 cup Pyrex measuring bowl or a large 8 cup-capacity bowl with extra virgin olive oil. I simply drizzled some in the bottom of the bowl and used to clean paper towel to cover the edges. You can also use a brush or spray with nonstick olive oil spray. 5. 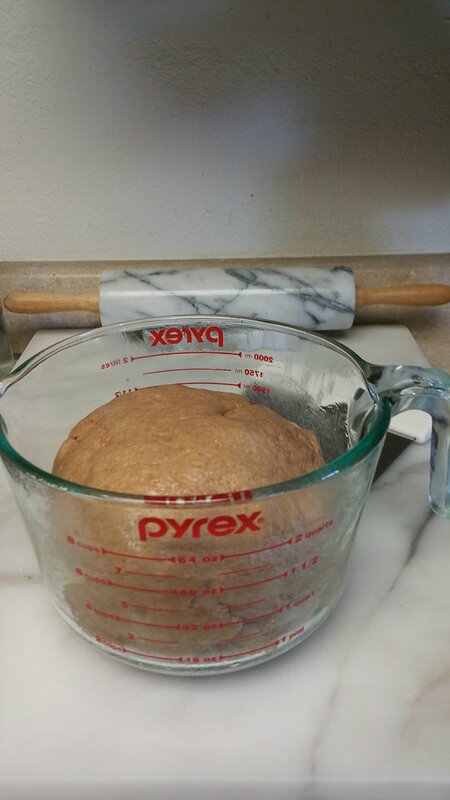 Let rise 1 hour with a clean kitchen towel covering the top of the greased dough ball. 6. 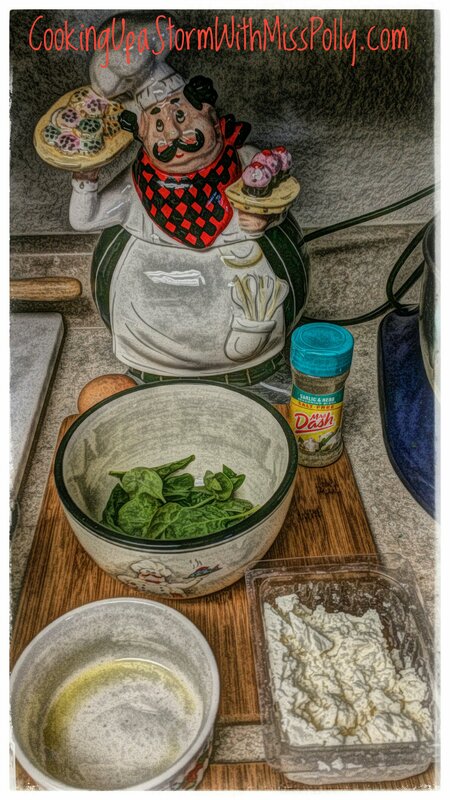 In an hour’s time your dough should look fantastic and risen and be ready to punch down. 7. Once you expel all the air out of the dough Bowl then take the grease dough ball and put it on a marble slab or clean baking area. 9. 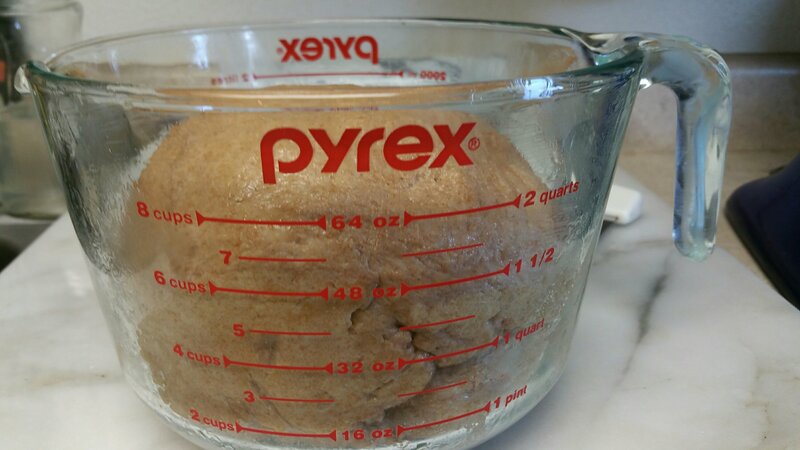 Set a timer for 1 hour and let the dough rise again after punching it down. 10. Cut the dough in half after it’s risen the second time with a dough cutter, pizza cutter or sharp knife in half. 11. You can shape the dough in any of these three ways, or come up with a new shape on your own! 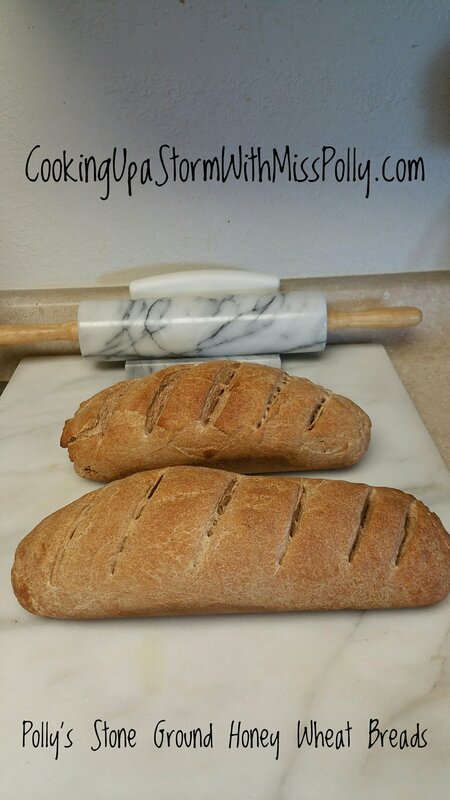 1-Baguette-Shape each half into a log form that will be formed into a loaf pan size. If you’re lucky enough to have a baguette pan, then you can shape them really thinly and then place them into a corn meal covered baguette pan. 2-You can simply roll it into a nice-looking BALL and score with an x on top with a sharp knife, and have a european-style boule. You can make a few slashes with a very sharp knife on the top for decoration and put a little dusting of flour on the top for a more European look. 3-Or you can shape it like a ciabatta. 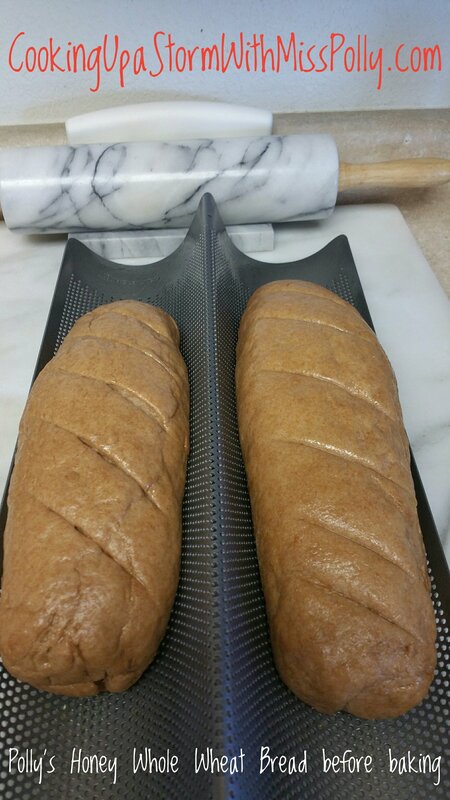 Pre-heat your oven to 450 degrees Fahrenheit and get it ready for the shaped, unbaked bread loaves 15 minutes prior to putting the bread in the oven. Bake 10 minutes at 450 degrees you’ll then reduce the temperature to 375 degrees and bake an additional 45 to 60 minutes for a boule or a baguette, 30 minutes additional after the initial 10 minutes at 450 for a ciabatta, due to the thinness and also the crushing of the olive oil on top. Before baking my bread baguettes I sprayed my baguettes with extra virgin olive oil cooking spray. You can also brush them lightly with extra virgin olive oil and then gently blotted them with a paper towel or you can simply rub the oil in. 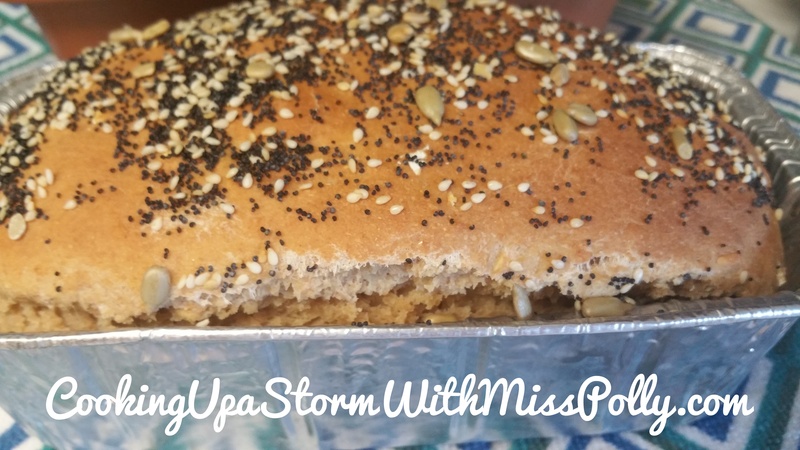 There was no oil added to this bread recipe and so I felt it needed some more moisture on the outside so it would be dry. Bake the bread baguettes 45 minutes at 375 degrees after the initial 10 minutes at 4:50, and check your breads after 45 minutes baking. It just varies on a lot of factors how long the bread will take to bake the high-end is about 1 hour. My bread baguettes were baked for 10 minutes at 450 degrees then the oven was lowered to 375 degrees and they were baked for an additional 40 minutes until they reached the internal temperature of 205 degrees. 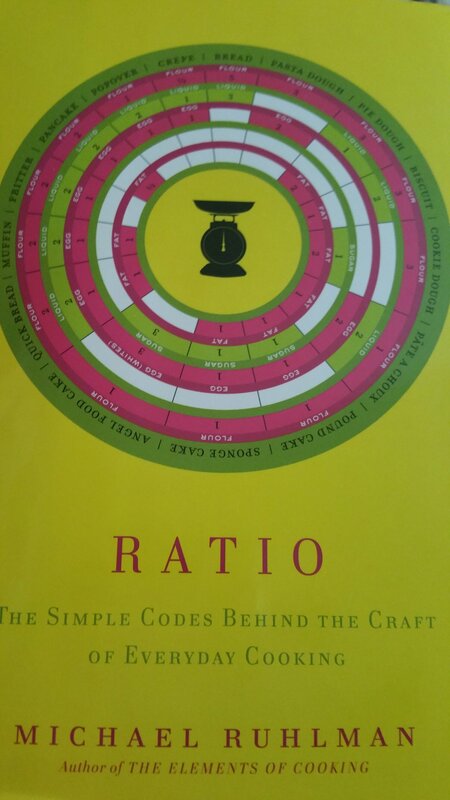 Inspired by the Master Bread Ratio in Michael Ruhlman’s fabulous cooking bible called “Ratio” by Michael Ruhlman. That is the book cover and I feel it is an absolute must have in your cook book collection for any serious-minded cook. Quote Paulette Motzko on that! Tuesday August 22nd 2017 5:17 p.m.